GP African Ruby (Rnd), Kanchanaburi Blue Sapphire Ring in Vermeil Yellow Gold with Platinum Overlay Sterling Silver 2.500 Ct.
African Ruby (Mrq)Ffiligree Ring in Sterling Silver 3.840 Ct. Designer Inspired-African Ruby (Rnd 2.35 Ct), Natural White Cambodian Zircon Wavy Ring in Platinum Overlay Sterling Silver 3.250 Ct, Number of Gemstones - 123. RACHEL GALLEY African Ruby (Rnd) Ring in Rhodium Overlay Sterling Silver 1.470 Ct, Silver wt 6.57 Gms. LucyQ - Open Drip Collection - African Ruby (Rnd) Ring in Rhodium and Gold Plated Sterling Silver 1.940 Ct.
African Ruby (Rnd 5.00 Ct), Natural Cambodian Zircon Ring in Platinum Overlay Sterling Silver 6.250 Ct.
Ruby is as beautiful as its name and when casted in gold, platinum or silver, it is a sight to be admired. Our rings with the bright hues of this ‘King of Gems’ are not only a personal style but a statement. TJC has hundreds of bestselling Ruby rings online in the form of engagement, eternity, and wedding rings for the prized customers of UK. There is a piece for everyone in TJC’s rich collection of gemstone rings; wear them as a solitaire, cluster, halo or a crossover; wear them as your heart desires. The birthstone for the month of July, Ruby is one of the four most precious and expensive stones, along with emerald, diamond and sapphire. Adorning the crown and jewellery of kings and queens since the beginning of time, Ruby is a magnificent stone possessing curative and stimulating properties. The discovery of Ruby can be traced back to 2,000 years before now and is believed to protect the wearer from evil, motivate to achieve goals, acquire leadership skills and amass wealth. TJC hand-picks this mystical gemstone from across the world and delivers the finest collection of Ruby Rings online in UK. Owing to its colour and inherent properties, it is Ruby’s fate to be donned as a symbol of love and passion. It is time for you to break free too and choose a unique and trend-breaking that will bring all the attention and eyes to you. Our exceptionally skilled designers and artisans create these pieces to balance your quest for a classic and contemporary collectible that is as much modern adept as it is chic. We offer you incredible designs of ruby rings for ladies that offer the best of all styles and fashions. Just come and look. Enclosing the brilliant red like the clouds of evening, Ruby and Diamond rings make the perfect accessory for a special occasion. 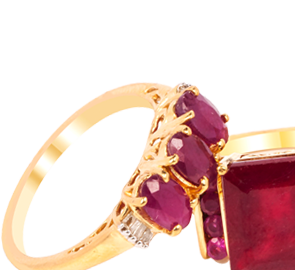 TJC has an opulent assortment of statement ruby rings and there is a piece or two to suit everyone’s style and taste. Choose from the hues ranging from pink, blood-red, purplish red to deep red, and the ring will be the favourite thing in your wardrobe. Also, the stone for the 15th and 40th wedding anniversaries, Ruby makes an impeccable gift choice. So, the lucky ladies born in July or celebrating the special days anytime soon, make sure you are dropping the right hints and not so subtle ones. Another showstopping collection that we feature brings you the bespoke and celebrative pieces of designer rings. Made from the brilliant minds and skilled works of our artisans, these exclusive stunners will not be seen anywhere else. Be it additions and twists in designs as simple as ruby rings in gold or lavish details seen in intricate patterns, we have something you’re going to love. Wear the absolutely coveted works of art that we feature and get picking for the unique beauty that calls out your name! Real ruby rings online at TJC have life in them, their colours and designs speak, say what words fail of. Hope you have already chosen the one that speaks for you!